Opera is one of the most popular browser and some people also think it is faster than other browser.Today in my post i will show you some opera tricks that you must know if you use opera as you’re primary browser. And a page will open that contain list of directories and files in your C drive it show the hidden files and directories in page.you can further navigate.Using simple clicks (See below image). Just browse through files and directories and open files in directories it will be helpful to find your downloaded files. 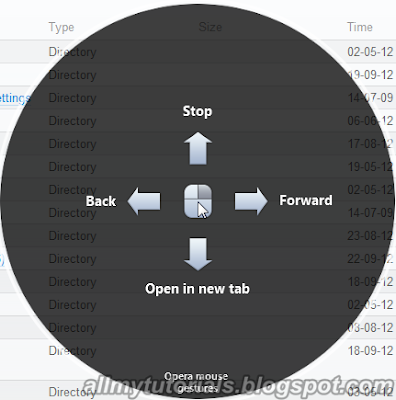 Do u know when you will hold right click on opera browser for 3 to 4 seconds a circle will pop through which you can navigate forward , backward , Stop and Open a new tab see below image of this circle navigator. Once a navigator will open you can move back and forward by moving to that position.That’s it hop you will like my this post and keep visiting my blog for more quality posts and don’t forget to subscribe to get all these quality post in you email directly .